For me, motorcycling is and always has been an emotional journey. I can’t disengage the act of riding the bike from the all encompassing connection to the world, my feelings, to people that it delivers me to. Since the loss of Cindy and Michael in September, I have struggled with an emotional rawness that kept me away from wanting to ride again. Witnessing the loss of life devastates you as a human being in ways that you cannot comprehend until you’ve had the misfortune to bear witness to it. As a human being, a little piece of you grieves at the instant loss of connection. An unrecoverable, unique piece of the greater human puzzle is missing and you just feel its absence. With these months that have passed I’ve come to no greater understanding of what took place. What can you say really, other than you just learn to accept it? What else can one do? So with these months now of associating my last big ride with such a sad event, I took a break. From the time she was very small, my daughter’s pediatrician always told me that I shouldn’t worry about making her eat x number of fruits and vegetables like a tyrant. Don’t worry, he said. When she needs something, she’ll take it. Her body knows when it’s time. This self-imposed break was much like that, I suppose. I stayed away until my body knew it was time to try again. As I mentioned to my friend Greg, my reawakening was something of a slow trickle set off I think by the planning of our spring trip to Kentucky. Poking around looking and maps and hotels – I love doing all of those things and I think that it helps me to focus on the positives. On my birthday last Sunday, I went out to the garage and started the Triple up for the first time since fall. She’d been dozing on the tender all that time. With the garage door open, I let her idle and warm up for 5 minutes. Like a word on the tip of my tongue that I just couldn’t quite get out, I mentally teetered on the brink of maybe heading out for a ride. It just wasn’t right, though. I shut her down, closed the garage door and went on about my day. That was the closest I’d come to maybe riding, since November. On Monday at work, I was reading ADVrider’s phototag thread for my locale. I knew where the latest tag was and no one had yet claimed it. The night was to be clear, the salt had been largely washed away with some good soaking rain… it was time. Provoked with a purpose I wriggled in the car all the way home with excitement about my secret. I was going to go for a ride. And I did. I went out after work into the cold, into the night to grab that tag. My worry that things would just seem kind of you know, off was quickly dispelled. The natural memory of the sound, the feel, and the motions all felt like home. In my mind what I’d built as a huge hurdle bedeviled me for about 30 seconds and then fluttered away in my wake. It felt good again. It did. I like to think now that there are another two souls that will ride the wind at my back and carry me safely on my journeys. See you on the road! Crap picture, I know… but this is the one that brought me back. Glad you are “Back in the Game”… and you are still my favorite writer! Very nice story indeed, can I ask where that F-14 Is displayed? 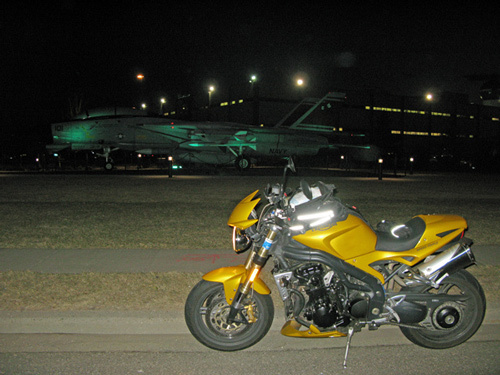 The F-14 is on display at the Grumman HQ in Bethpage, NY.